On a whim this weekend, I picked up this combination cookbook–food diary at the library: My Year in Meals by Rachael Ray. I then proceeded to basically read it cover to cover, twice. 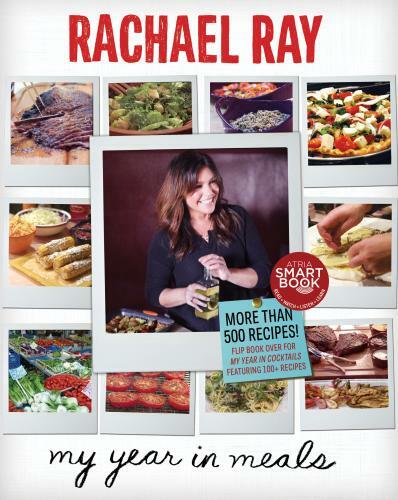 I'm weirdly obsessed with it – weirdly because ... Rachael Ray? I obviously don't despise Rachael Ray as much as so many food people do or I never would have picked it up in the first place, but the recipes from her show and the other cookbooks I've seen tend to be cutesy and gimmicky, and she has all these annoying verbal tics like always calling sandwiches "sammies." This book is different. It's a super-casual, almost bloggy approach to a cookbook. Instead of categorizing the recipes into appetizers, salads, fish, etc., the meals appear chronologically, like "JUNE 23 / BREAKFAST" and "JUNE 23 / DINNER." They aren't, for the most part, recipes that she developed for public consumption; they're family favorites or just the basic stuff that she actually cooks and eats at home (but sometimes for guests, so there are varying degrees of elaborateness). The photos are non-professional snaps she and her husband took themselves. Half the recipes are the kind of pseudo-recipes that I write: no amounts, just guidelines; everything is to taste. What I love most about it is that it illustrates the way home cooks cook when they're not trying to impress anyone. We tend to make variations on the same meals over and over, especially within a three- to five-month period (I'm currently in a "taco period"). If you're like me and my girl Rach, you don't use recipes most of the time; you have certain templates in your head (like a vinaigrette template) and you vary it up based on what you have on the kitchen, what's in season, etc. So you might use lemon instead of sherry vinegar one day, garlic instead of shallots, etc. And there's something at work I like to think of as recursive cooking: using leftovers in a kind of "upcycling" fashion in new but familiar dishes. In Rachael Ray's case it often involves cooking an enormous hunk of meat and then later using the leftovers in some kind of soup or "sammie." Or cooking extra risotto so she can make arancini the next day. In my case I might make an herb oil to use up some on-the-edge cilantro and then use it in different applications throughout the week: in salad dressing, scrambled eggs, stirred into cooked rice, etc. Or I'll start a new slaw (for tacos) using yesterday's leftover slaw and adding some new ingredients. Or use leftover roasted broccoli as a topping for pizza. RR makes her own giardiniera and uses it in everything; I make a batch of salsa every week and use it in everything. It's a smaller-scale, evolving version of using the same starter in your sourdough for years/decades. Recursive, see? It's the kind of cookbook I would want to write. And she's inspired me to make a kind of green huevos rancheros tonight using some leftover enchilada sauce (which I made last week with tomatillos, cilantro, jalapenos, sour cream, etc.) as a starter. Let's start a recursive cooking movement! To make an apple pie from scratch, first you must make the universe. But an even thornier problem: to make Guinness stout, first you must make Guinness stout. Oh no kidding! I didn't know that. The first pint was missing something. I hadn't realized that the "food period" thing was common; I thought I was weird for it! ("Dear God, is it okay to have curry for lunch every day for five weeks? Love, Margaret") I'm attempting to do more recursive cooking but since I live alone it's happened too many times that I've overestimated the amount of the base food that I can consume and I wind up with, like, half a pound of salmon that I can't use. But practice, practice! I totally do the food period thing. I'll find a thing I like and make variations on it over and over for months before I get sick of it. One of the benefits is that it makes grocery shopping easier. Aside from tacos, another thing I make a lot these days is the kale and eggs I blogged about recently, which is different every time depending on what is in the fridge. A couple of years ago, it was this pasta and zucchini recipe from Food and Wine (which I improved with garlic, ricotta and other sundry delites). I've taken one bath in the past 6 or 7 years. It was at a hotel that had an enormous tub. It was OK. It got boring fast. If you're interested in recursive cooking (and beautiful food writing), you must check out Tamar Adler's "The Everlasting Meal." I second this recommendation! "An Everlasting Meal" got me out of a huge cooking rut, and is worth it for the garlicky stems & core pesto recipe alone. I'm going to check out "My Year in Meals" while I wait for the cookbook you're writing. Some of the things you say here about recursive cooking (a term I haven't run across before) reminds me of how my mom cooked, and even more so, how her mom cooked. Chicken and dumplings: it started with pulling leftover chicken meat off the bones. Or, making banana bread from bananas that were near the end of their ripeness. When my mom was young (during the Depression of the 1930's), my grandma would save the water from boiling potatoes, and she would use it to make potato bread. I likely could think of other examples of this kind of thing if I thought for a little while. Potato stock! Haven't heard of that one before. I always feel bad throwing out the green water when I boil kale or broccoli -- must be chock-full of vitamins.